Command Small Metallic Hooks give you options for every room and every person in your home. Using the revolutionary Command Adhesive, Command Small Metallic Hooks hold strongly on a variety of surfaces, including paint, wood, tile and more. They also come off cleanly - no holes, marks, sticky residue or stains - so you can take down and move your Command Small Metallic Hooks as often as you like. Reusing them is as easy as applying a Command Refill Strip, so you can take down, move and reuse them again and again! Perfect for displaying and organizing your jewellery, the Command jewellery Rack with Command Clear Hooks and Strips blends in seamlessly with your bedroom or closet, allowing you to show off what matters most not how it's hung up. 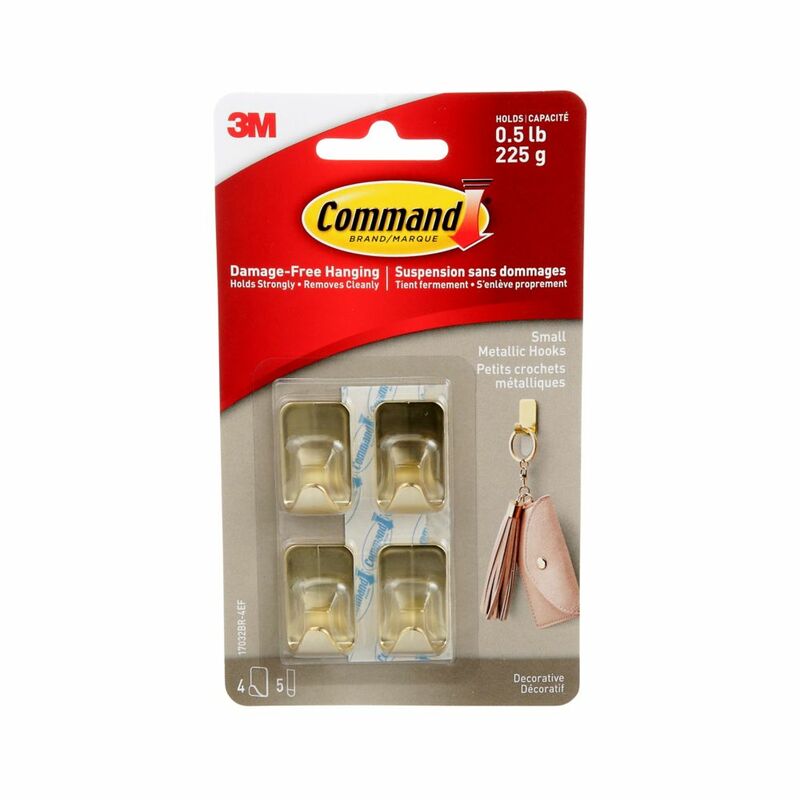 Command Damage-Free Hanging Hooks hold strongly on a variety of surfaces, including paint, wood, tile and more. When you are ready to remove your Command Hook, it comes off cleanly without damaging surfaces with holes, marks, sticky residue or stains. Small Metallic Hooks, 17032BR-4EF, brass Command Small Metallic Hooks give you options for every room and every person in your home. Using the revolutionary Command Adhesive, Command Small Metallic Hooks hold strongly on a variety of surfaces, including paint, wood, tile and more. They also come off cleanly - no holes, marks, sticky residue or stains - so you can take down and move your Command Small Metallic Hooks as often as you like. Reusing them is as easy as applying a Command Refill Strip, so you can take down, move and reuse them again and again!